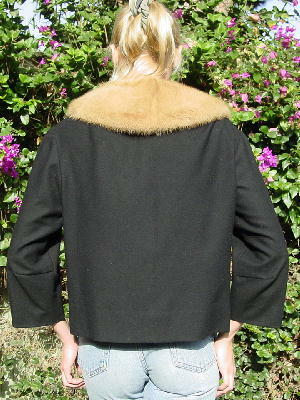 This vintage (late '50s) black wool jacket with a mink collar was custom-made for a Beverly Hills socialite whose model granddaughter swiped it from her. The ends of the mink collar hook together. There are 2 textured black buttons. 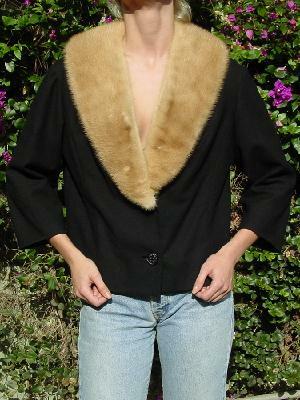 The model wore it with her Armani jeans and was considering altering it to wear with skirts and dresses, but decided not to, since it would have wrecked the look of this vintage jacket. She sold it when she moved to Miami. shoulder to end of sleeve 18"